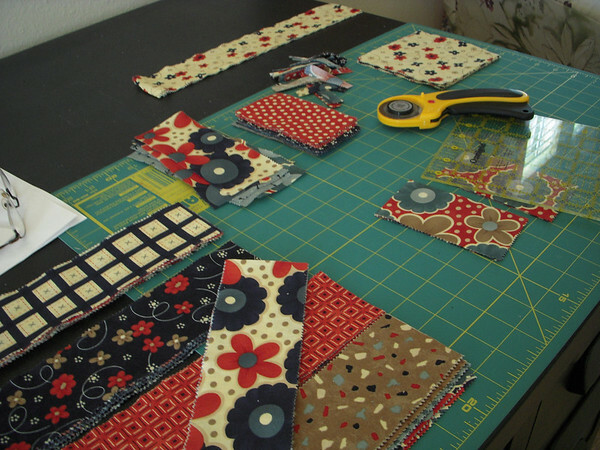 There are a few things that really worry me about constructing a quilt but one of them is cutting into fabric. At times it's an easy thing, like when the fabric is cheap or when you have an over abundance of the fabric in question, but other times you have a REALLY hard time getting that rotary cutter to touch the fabric. This was something I really never thought much about until this past weekend. I recently bought a jelly roll and two charm packs of Sandy Gervais Zippity Doo Dah Moda line. I hadn't notice the line until I visited a local quilt shop and they had a quilt made from the jelly roll and they had the line on sale. Now, to find anything Moda on sale is a prize but this line was just so darn cute, I had to buy it. I later realized two things a) the line was on sale because it was retiring and b) when you buy fabric without a project in mind you will drive yourself crazy! I spent over a week looking at the thing thinking I wanted to make a lap quilt out of it but it had to be a larger lap quilt (over 65"). I could not find a pattern for the life of me. Then when I finally found a design I could make and I made my measurements, I could not bring myself to make the first cut. What if I measured wrong? (I was not following a tested pattern but converting it from a picture I saw), What if I didn't have enough fabric? What if I cut the pieces wrong and THEN run out of fabric? I definitely could not afford another trip to the quilt shop. Yeah. 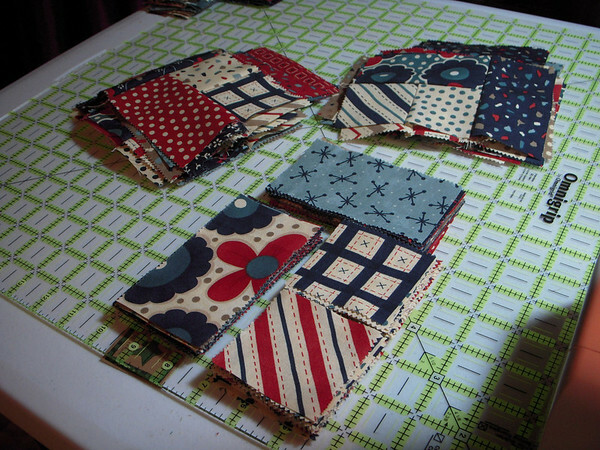 I spent all Saturday walking by the cutting table staring at the fabric. I cut and sewed a few 'test' blocks with scraps I had at hand to make sure my calculations were correct and still no cutting into the darn thing. Finally, on Sunday I woke up early and just did it. I set aside the light colored fabric from the line to serve as a framing border and cut into the mediums and darks. I'm still not sure that I'll have enough to finish the top since it needs a few borders to reach the desired size but I know that I can make all the center blocks. I tend to have to cross a mental threshold where I say to myself, Screw it! I won't die if it ends up a royal mess! The quilt has (16) - 13" center blocks composed of (4) smaller 6.5" blocks and a sash. I have completed 40 of the 64 smaller blocks needed. One way or another I believe this will be another 'finished' project by the end of the month. BTW: The other great fear I have is chosing the right colors for the quilt. What about you? Is there anything that ties you up in knots when it comes to tackling a project? 3 comments on "The Fear of Cutting"
I really like the fabrics! looks good so far! OK so I want to know how I read this post on Facebook and it's a blog Post...are you trying to confuse me??? It doesn't take much y'know! I'm feeding my blog to Facebook. Sorry!